IGA grocery store promotion of fresh Florida oranges comes to Regent Public School. 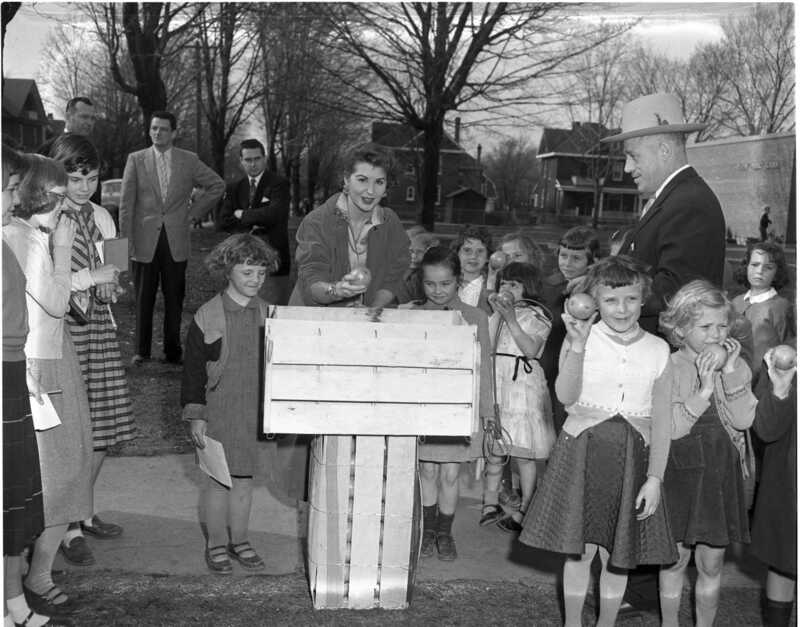 Ruth Newman, Miss Florida Sunshine, distributes oranges to every child in Midland primary classes. Brenda Dalziel and Shirley Hornsby and teachers Bill Barnett and Mac Wilson watch from behind. Mrs. M. Adamson celebrating her 85th birthday on April 12. She has been a Midland resident for 20 years. Hero of Dieppe where he won the V.C., Major John W. Foote, minister of Reform Institutions for Ontario has agreed to establish a pilot project for a conservation farm in North Simcoe at a meeting in Midland Thursday night. 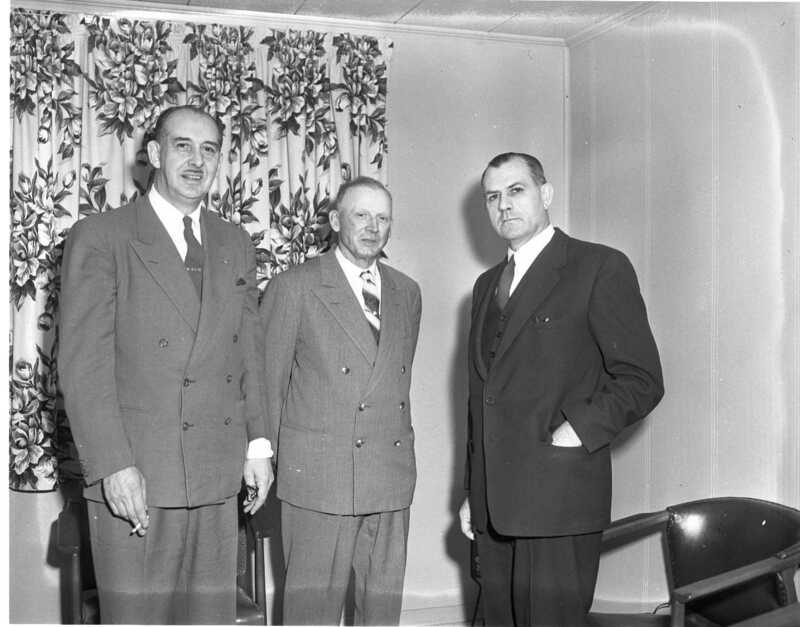 Greeted here in the Midtown Motel by Simcoe North MPP Lloyd Letherby of Coldwater, left, and Reeve Fisher Ganton, center, whose Medonte Township is ideal for the project. This is a reform school for juvenile delinquents, know to us as Camp Hillsdale. Eugene Ladoucer, left Midland for British Columbia in 1907 and this is his first trip back home since then. 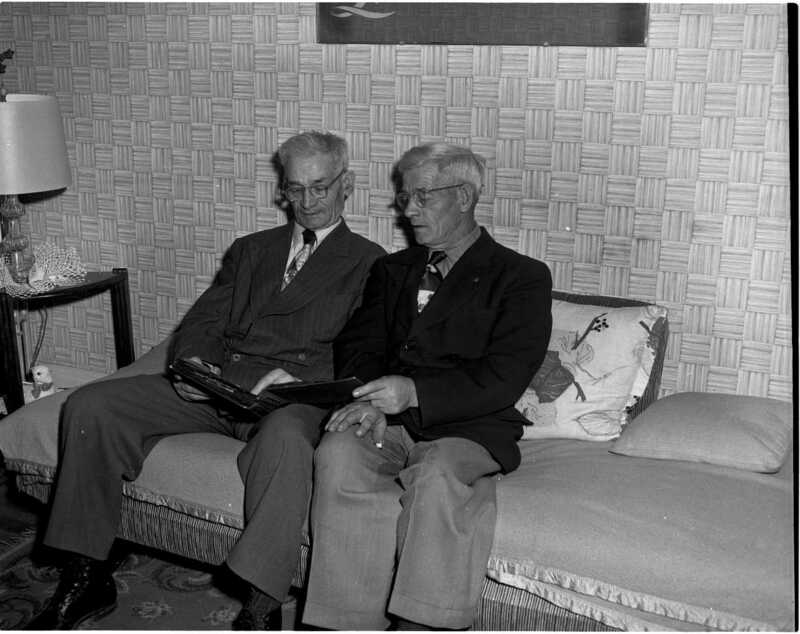 He visits with his brother Peter, on the right, of 173 Lindsay Street. A sister, Jenny, Mrs. Joe Lefaive of Perkinsfield was surprised to see her brother. The three are the only survivors of 5 boys and four girls of Mr. & Mrs. Eugene Ladoucer Sr., originally from Cedar Point. Eugene has had his own cattle ranch near Kamloops most of his working life. Young players from MPDHS perform the play “Happy Journey” in the hall at St. Paul’s United Church part of a district high school drama festival. Patsy Perrin greets bride and groom Vera Sibbald and Dennis Murphy and their attendants in the back seat, Anne Shiels and Frank Okenka. “Happy Journey” had a happy ending Friday night for these students from MPDHS when their play won the top award in the Georgian Bay Drama Festival staged at St. Paul’s auditorium. 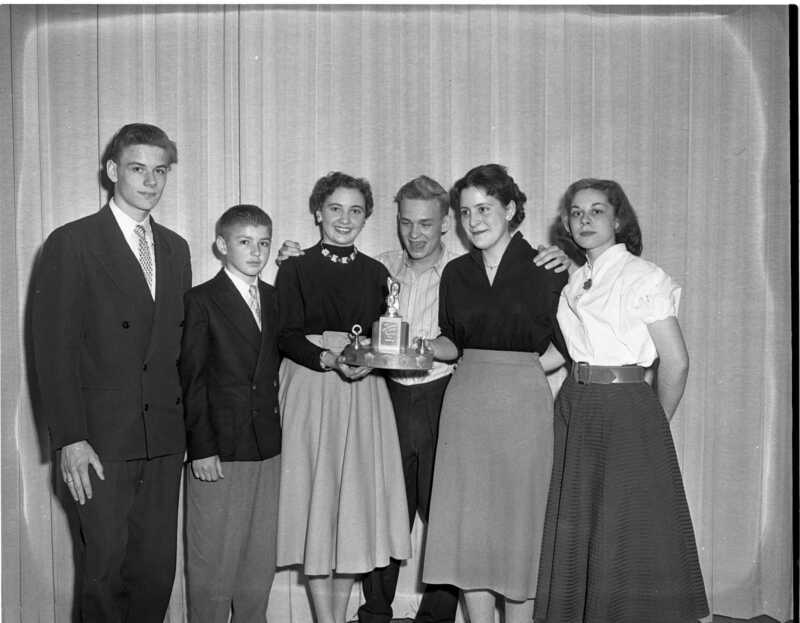 Dennis Murphy, Frank Okenka, Anne Shiels, Wayne Parker, Patsy Perrin and Vera Sibbald. 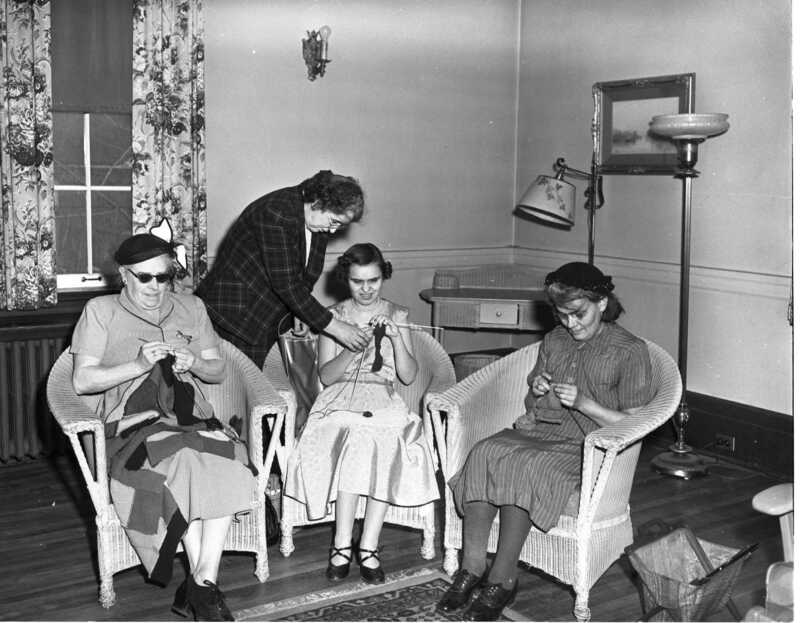 Three area sightless citizens are seen at the Midland YMCA receiving knitting instruction from Miss Emily Philpott of the Barrie CNIB office. Meetings are held every two weeks. 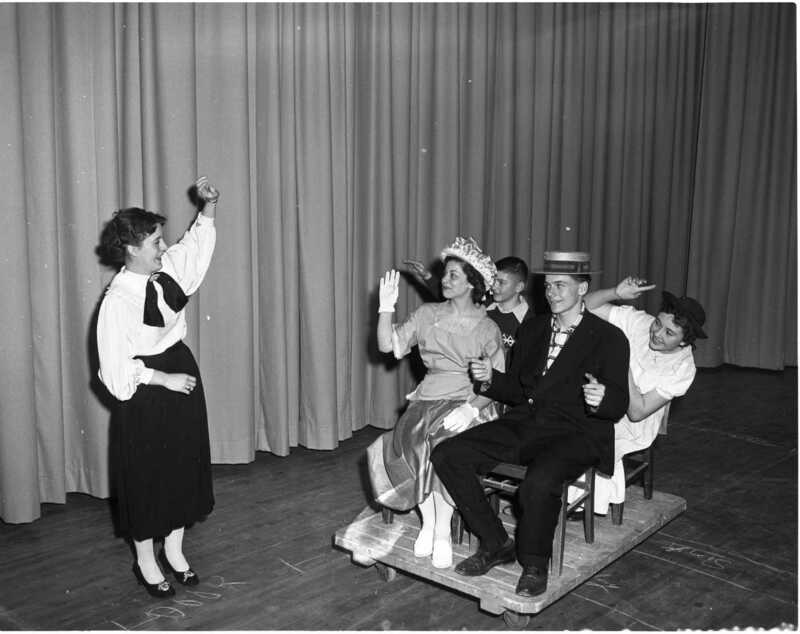 Seated are; Mrs. George Smallwood, Midland; Miss Georgina Robitaille, Penetang; Miss Cassie Campbell, Midland. John Fraser, veteran Scottish baker loves living and working in Midland. John came here in 1924 and worked for A. W. Ruby. 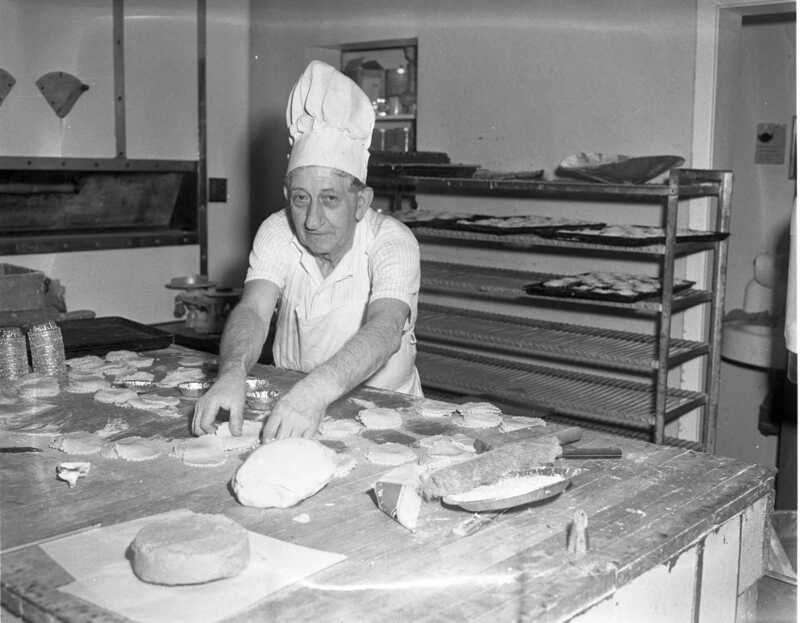 When Ruby sold to Ontario Bakers John moved to Timmins returning in 1926 when Ruby got back into business. He worked in Toronto during the war returning to Midland he worked for Art Fry, Stoneburghs and finally Burnies on Elizabeth Street. 1950 model car pulled from the bay Sunday at the Simcoe Elevator slip. Owned by Leonard Archer of Elmvale who had parked it 66 feet away from the water while he visited a friend on board a freighter only to be notified it had rolled into the bay. The ship crushed the roof as it moved away from the dock and the car is a right off. The location is behind Boyd’s service station on the south east corner of Yonge and King Streets. 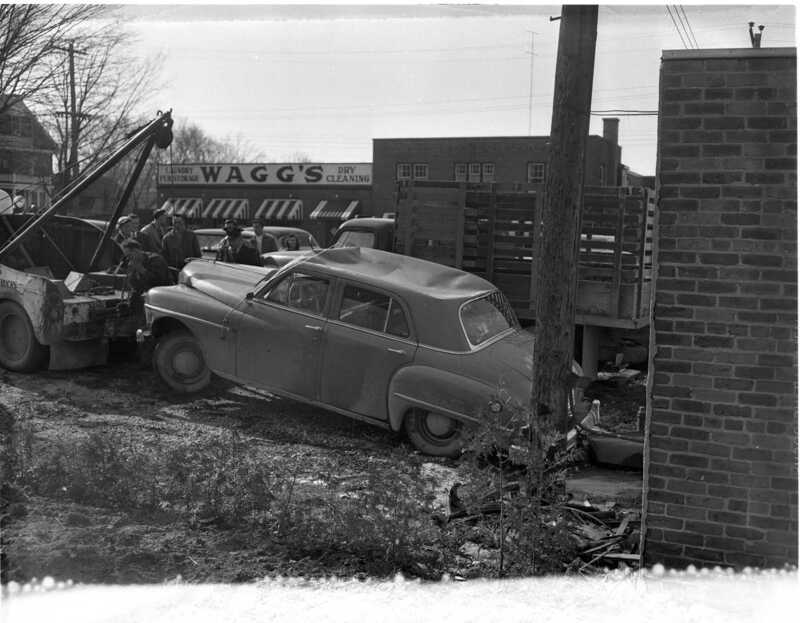 Good view of the entrance to Wagg’s Laundry on Yonge Street. Permanent paving coming for Penetang streets. Province to fund 50% of the five mile project and 80% of the replacement of the bridge over Copeland Creek. Councillor Ray MacDonald explained that doing a larger project reduced the cost and that a 20 year debenture would be used. It currently costs $4,500.00 per year to oil the streets. 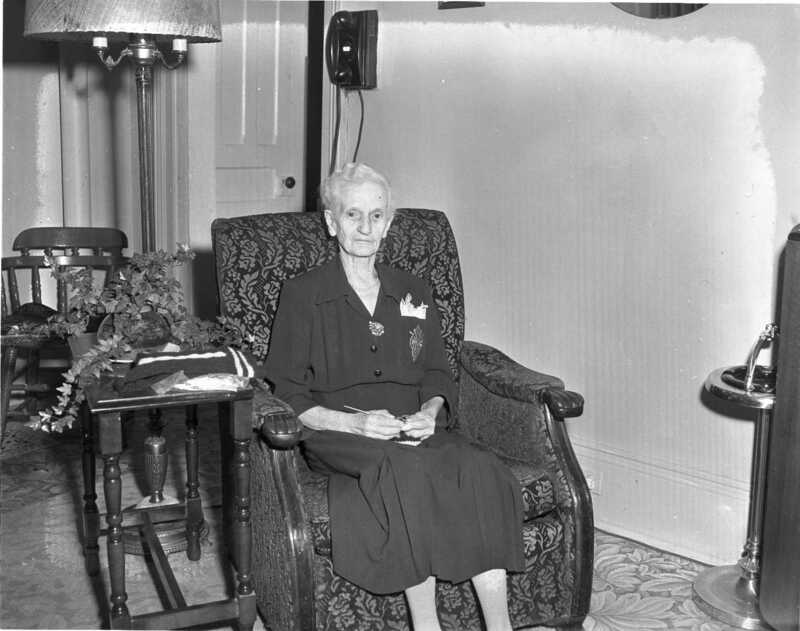 Shirley Ann Thompson, daughter of Mr. & Mrs. Robert Thompson, Midland, marries James Albert Park, son of Mrs. and the late J. H. Park, Midland. The flower girl was the grooms niece Mary Jane Park. March 24th at the Calvary Baptist Church, Midland. $15,000.00 bequest from the estate of Emily A. Bryson gives hope that St. Andrew’s Hospital may break even this year. Public Utilities Commission in Midland studies a proposal to meter water to town residents. Georgian Bay Hunters and Anglers plans to proceed with scheduled projects on its 50 acre property below the Shrine, President Bill Russell revealed. Plans include a club house, trout ponds and reforestation. Construction started on Wednesday April 18th of the new County Aged Home by local contractor W. G. How, estimated cost, $275,000.00. Emery Electric will do the electrical, George Price & Co. of Coldwater the plumbing, W. Lalonde of Midland will do the painting and decorating. Percy Crawford of Midland will superintend the project. Polio shots available to all elementary students in the County this year, with parental consent. Mostyn’s advertising two stores to serve you, 234 and 238 King Street. Hay selling for $20 to $25 per ton this spring in North Simcoe. Door to door peanut canvas by the Midland Y’s Men’s Club to raise money for playground equipment. Midland Community Concert Association holds last event Monday night, advent of television blamed for declining numbers. Soprano Ethel Barrymore Colt headlined the final event.